I hadn’t eaten a fish stick in years. As a kid, I always preferred fish sticks to burgers. In fact, that was about the only school cafeteria lunch item I ever ate, but I never touched the tartar sauce. I don't even know if kids still like fish sticks these days. At some point they disappeared from my diet. I assume that disappearance happened right about the time I was old enough to realize a re-heated, frozen, breaded piece of white fish left something to be desired in flavor, and I have no idea when it was I changed my mind about tartar sauce. 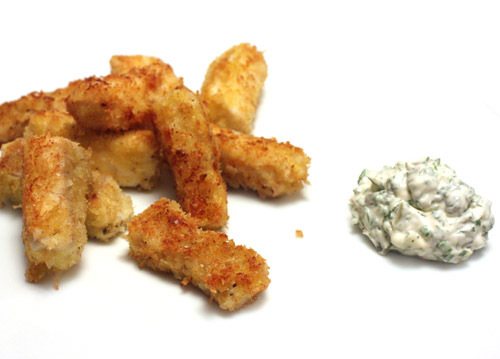 So, when I saw this grown-up version of fish sticks with fresh halibut and a pickly, herby, homemade tartar sauce in the June Bon Appetit, I had to try it. I’m pretty sure this version could convince any adult to see fish sticks in a new light. The sticks were pan sauteed rather than deep fried, so there’s no heavy, greasiness about them, and the panko coating made them as crispy as can be. The tartar sauce came together with mayonnaise, chopped fresh dill, capers, chopped fresh chives, and finely chopped cornichons. Maybe I would have liked tartar sauce all along if it had always been made like this. 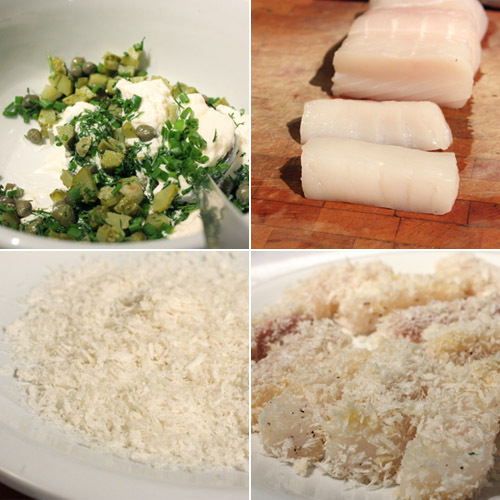 For the fish sticks, fresh halibut was cut into short, narrow pieces and seasoned. Then, it was coated in egg and dredged in panko breadcrumbs. It cooked quickly in a nonstick skillet with just a tablespoon and a half of oil. It was a quick meal and a nostalgic one as well. 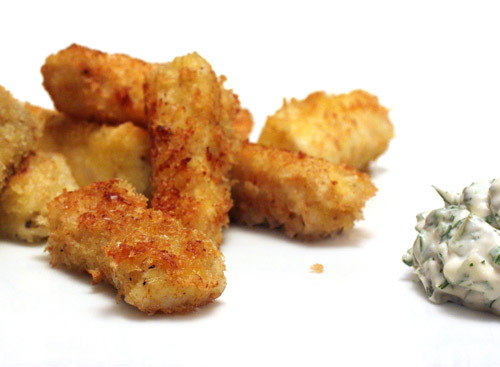 Unlike the ones that came out of a box, these fish sticks were light, crunchy, and fresh-tasting. The tartar sauce was rich and tangy and addictive. I can’t remember what side dish the school cafeteria used to serve with their fish sticks, but it might have been tater tots. We enjoyed these with salad instead, and they surpassed any memory I had of fish sticks. I think they've found their way back into my diet for the foreseeable future. When I was invited to a hog roast last weekend, my first thought was to bring a salad. There was going to be a lot of pork on offer, so something green and leafy would at least be a good contrast. This hog roast was a celebration of local food with the hog itself coming from a nearby farm. 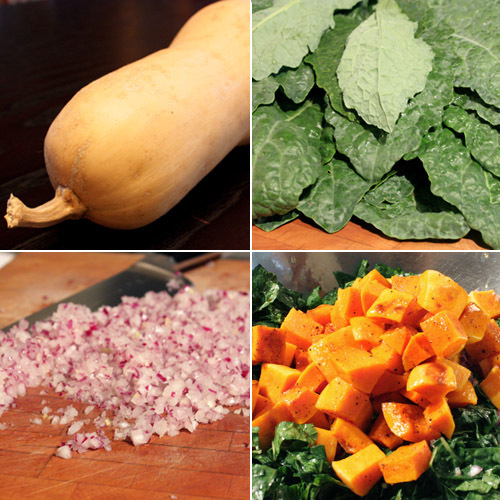 I had just received my first butternut squash of the season from my CSA, and I found a couple of varieties of kale and red onions at the farmers’ market the morning of the party. And, I had ideas about raw kale. The week before, I attended a Health Starts Here cooking class at Whole Foods, and I posted a few photos from the class on Facebook. One of the dishes demonstrated was a raw kale salad, and the cut leaves were tenderized and wilted by squeezing the dressing into them by hand. I went with different flavors for my salad, but that technique made all the difference. This was something I made up as I went along without really measuring, but I’ll do my best to list approximate quantities in a recipe below. I used dinosaur kale, but any variety would have been great. I cut the thick parts of the ribs from the leaves and then chopped the leaves into little ribbons. The ribboned leaves were washed and spun dry in a salad spinner, and then they went into a big bowl with finely chopped red onion. I poured some aged balsamic vinegar over the kale and reached in to scrunch away. You want to work the vinegar into the leaves, and the squeezing and scrunching will soften the kale. For the pecans, I imagined a little spice on them would add a faint bit of heat and interest to the salad. I whisked some chimayo chile powder, salt, and sugar into an egg white and then tossed the pecans in that mixture. Once well coated, they were toasted in the oven for about 20 minutes. 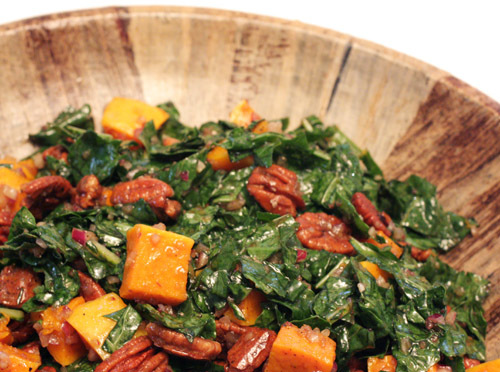 The pecans and cubes of butternut squash and a small splash of olive oil were tossed with the kale to complete the salad. The pig was the star of the night. When it was brought in for carving, it had everyone’s attention. I even tasted a piece of cheek and a bite of belly. It was a fine roasted hog, and the salad was indeed a good side dish. The sweet, spicy, and savory items balanced the bitter greens, and the leaves were slightly wilted with a little crispness intact. I’ve already decided I’m making this salad again for Thanksgiving and probably a few times between now and then. *note: the size of a bunch of kale will vary, so taste as you go and adjust as needed when adding the vinegar and olive oil to the salad. -Cut thick parts of ribs from leaves of kale. Then, cut leaves in half lenghthwise and then into ribbons crosswise. Soak cut leaves in a large bowl of water. Swish to remove grit, and then allow grit to fall to bottom of bowl. Pick leaves up out of water and place in basket of a salad spinner and spin dry. Placed washed leaves in a large mixing bowl. Add finely diced red onion. Pour two tablespooons aged balsamic over kale and onion and squeeze and scrunch the leaves with your hands. You want to tenderize the kale and work the vinegar into the leaves. 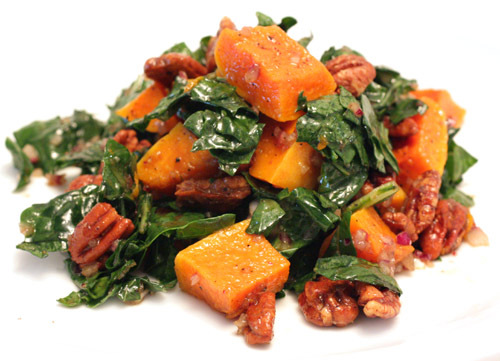 -Add roasted squash cubes, toasted pecans, two tablespoons extra virgin olive oil, and salt and pepper to taste, and carefully toss to combine so squash cubes remain whole. The oil used in roasting the squash along with the pecans add richness to the salad, so nut much additional olive oil is needed. I used about two tablespoons, but taste as you add. This is going to sound slightly irrational, but I changed my mind about fall. Right after explaining how I attempted to make fall happen by baking with apples and pears, it occurred to me that I hadn’t baked with plums yet this year. So, if we could just hit pause on fall for a moment while we enjoy this cake, then we can get back to letting the change of seasons happen as it may. And, this isn’t my fault. 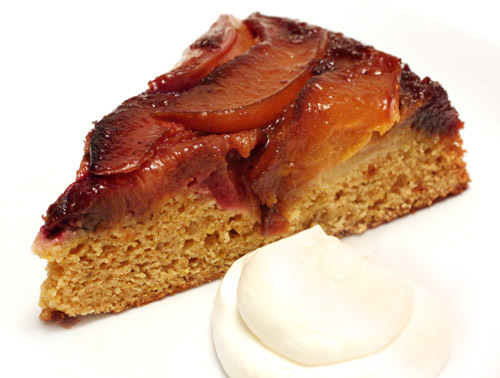 I blame all the other food blogs out there that are showing off gorgeous baked goods with plums. Everywhere I looked, I saw tarts and cakes brimming with late summer fruits, and I had to bake something with them too. 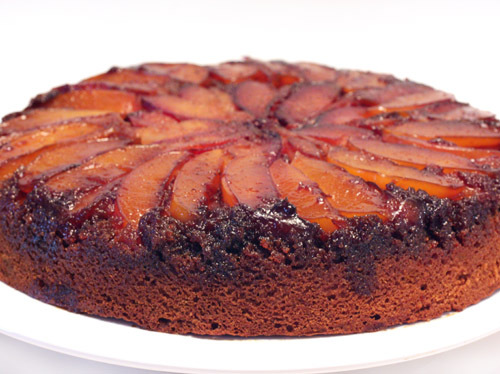 I rushed out to grab some pretty, red plums and yellow nectarines so I could attempt my first ever upside-down cake. The recipe is from Deborah Madison’s Seasonal Fruit Desserts , and the upside-down part was not at all as scary as I thought it might be. The process began by making a caramel in a cast-iron skillet with melted butter and light brown sugar. After cooking for just a few minutes, the heat was turned off, and the sliced nectarines and plums were layered into the caramel. The cake batter was started by mixing together butter, sugar, orange zest, vanilla and almond extracts, and eggs. Multiple flours were used here, and those included all-purpose flour, corn flour for flavor, and whole wheat pastry flour for sturdiness. The flours were combined with baking powder, baking soda, and salt, and that was added to the butter mixture in parts alternating with buttermilk. The batter was spread over the sliced fruit in the cast-iron skillet, and the cake was baked until golden. After removing the pan from the oven, you want to flip the cake out of it while it’s hot to prevent the fruit from sticking to the bottom. Running a knife around the edge helps loosen the cake from the sides, then cover the skillet with a platter, lift with a towel or oven mitts, and invert it. I was sure I was going to have a sticky mess all over my kitchen and myself for that matter after attempting that maneuver, but no, the cake plopped out without any issues. 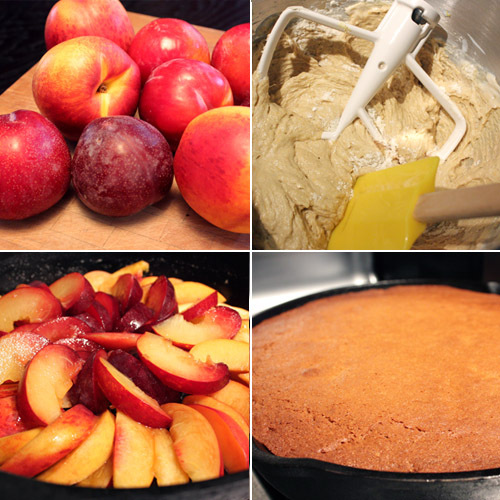 The reds and yellows of the nectarines and plums fade a bit while baking and meld into the color of the cake, but upside-down on a platter, the sliced fruit shines in the caramel. The mix of flours did give the cake itself good character. I served whipped cream on the side which was a nice contrast with the warm, just-baked cake. I’m glad I grabbed those summer fruits before they were gone, and now I’ll let fall resume its schedule. While I was in the desert, Austin received a whole lot of rain, and since I’ve returned home, we’ve had a few more rainy days. All this rain means my basil plants couldn’t be happier. Happy basil means pesto. I found a slightly different approach to basil pesto in Martha Stewart's Healthy Quick Cook . That version uses roasted garlic and rough-cut basil leaves with very little olive oil. I went that route, sort of, for a lighter style of pesto. Rather than rough cutting, I tossed everything into a food processor, and I had some pine nuts on hand, so I added them as well. 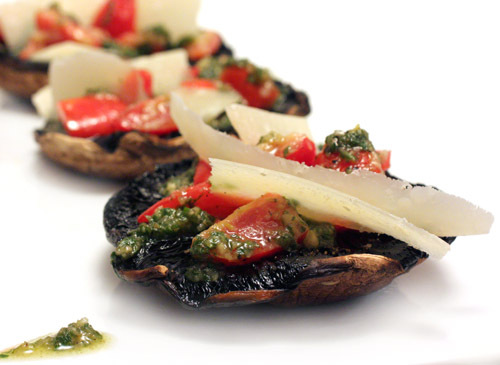 Also in that book, this light pesto is used on grilled portobellos topped with a cherry tomato salad with more roasted garlic and shavings of parmigiano reggiano. I’ve made a few versions of portobello pizzas before, and one of my favorites involved hummus and a thick slab of feta. 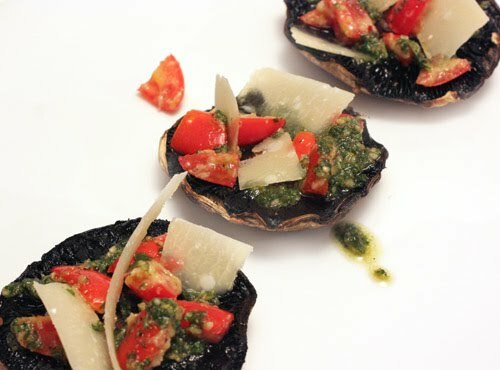 The portobello pizzas shown here were much lighter but just as flavorful. It’s amazing how substantial a portobello seems although it’s all vegetable, and roasted garlic and parmigiano add great depth and interest. Because this book is devoted to healthy dishes, very little oil is used in the recipes. Now, ordinarily, when I roast garlic, I cut off the tops of the bulbs, pour olive oil over them, and add salt and pepper. This time, I skipped the oil on the garlic and just added a small pinch of salt and some crushed red pepper flakes. I wrapped the garlic in parchment and foil and roasted it for about 40 minutes. Once cool enough to handle, I squeezed the soft garlic from the bulbs. It’s just as delicious without the oil. Some of that was used in the basil pesto, and the rest was used in the cherry tomato salad. Thyme leaves and chopped cherry tomatoes were added to the mashed, roasted garlic and a scant tablespoon of olive oil, and it was tossed to combine. I used some locally grown portobellos that were lightly brushed with oil and seasoned before being grilled for four minutes per side. They were then topped with the cherry tomato and roasted garlic salad, they got a drizzle of basil pesto, and shaved parmigiano reggiano was set on top of each. Admittedly, I don’t always cook with light and healthy in mind, but a dish like this is a great reminder than you don’t always need as much oil in a recipe as you might think. This certainly didn’t taste like diet food. 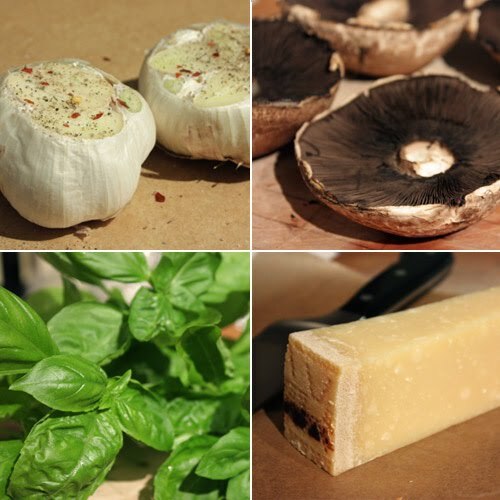 It was also a reminder that with ingredients like homegrown basil, fresh, local tomatoes and portobellos, and great cheese, you don’t need to embellish them much. And, with this way of cooking, my bottle of olive oil will last a little longer. I didn’t know that bene means sesame in Gambia and Senegal. It’s spelled benne in the southeastern area of the US, and it’s pronounced ‘bennie.’ I learned those facts and several others from The Food, Folklore, and Art of Lowcountry Cooking by Joseph Dabney. I received a review copy of this book which describes the culinary, agricultural, hunting and gathering, and social traditions of the southeastern coastal plain region from South Carolina’s northern coast to Darien, Georgia also known as the Lowcountry. In addition to historical information, the book includes recipes for classic dishes like boiled peanuts and peanut soup, country captain with chicken and shrimp, Vidalia onion and tomato pie, and a few different versions of grits. In the benne seed chapter, it's explained that the seeds were brought to the US by African slaves during the colonial period and are now a legacy Lowcountry plant. Over time, the seeds came to be used in candies, cakes, cookies, breads, salads, and seafood dishes. 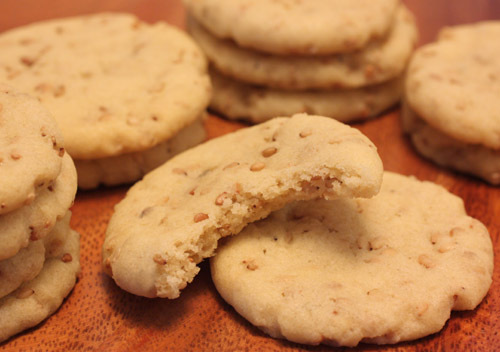 The cookie recipe shown here is from Clementa “Ment” Florio from Charleston, and it was also featured in Southern Living magazine in 2005. 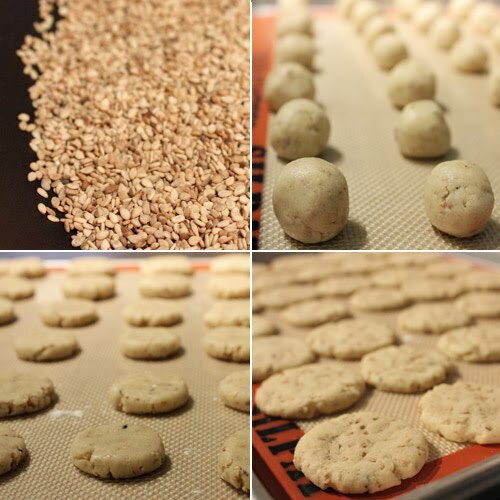 The cookies are made from little, teaspoon-sized balls of dough packed with toasted sesame seeds. 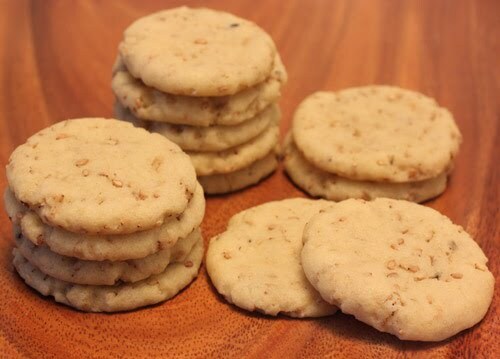 Because they’re so small, the recipe makes a lot of cookies, but their small size also makes them very snack-worthy. To start, a half cup of sesame seeds were toasted in a dry skillet. Then, softened butter was mixed until creamy, and sugar was slowly added. The toasted sesame seeds, an egg, and vanilla were incorporated. In a separate bowl, flour, baking powder, baking soda, and salt were sifted together and then stirred into the butter mixture. The dough was chilled for an hour before being rolled into half-inch wide balls and placed on a baking sheet. The dough balls were flattened with a floured, flat-bottomed glass before baking for about ten minutes. These simple butter cookies are light in texture with some crunch from the sesame seeds, and their innocent, little size makes you want to grab one after another. It’s nice to learn a bit about the history of a place while enjoying a time-honored recipe. In fact, I look forward to more of this style of learning with Carolina gold rice and a seafood stew. I was flipping tv channels a couple of weeks ago, and I caught the very end of a segment in which Giada was making a rustic crostata with dried apricots, walnuts, and cubes of taleggio. It sounded like such an interesting mix, and it sounded so autumnal, I was sure I could make it seem like fall around here by baking it. 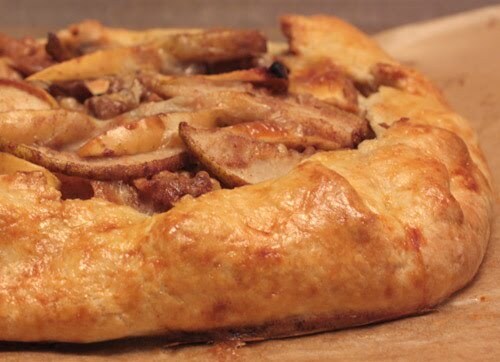 By the time I was ready to get baking, we had received some apples and pears from our CSA, so I changed the plan just slightly by using those fresh fruits instead of dried apricots. Now, about that cheese, yes, it is usually a savory cheese. Taleggio is a soft, washed rind cheese that’s relatively mild-flavored, and I was curious about how it would work in a sweet dessert. 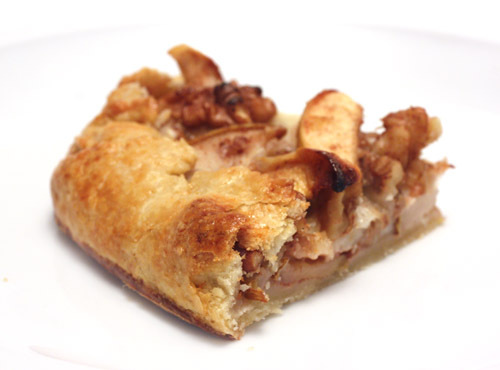 As it melted into the fruit and nuts, it added richness and interest, and if you weren’t told it was there, you might not realize there was cheese in the filling at all. The crostata was perfect served warm from the oven, and I preferred the leftovers re-heated rather than served cold from the refrigerator. There wasn’t just cheese in the filling, there was also mascarpone in the crust. The dough was made in a food processor by combining flour, salt, sugar, and butter. It was pulsed until the butter was coarsely mixed into the flour, and mascarpone and lemon juice were added. The machine was pulsed a few more times, and then it was left running briefly while ice water was added. The dough was wrapped and refrigerated for 30 minutes before being rolled out on parchment paper cut to the size of a baking sheet. That was a great tip by the way. By rolling the dough on parchment paper, it was very easy to lift the paper and move it with the dough to a baking sheet in one fell swoop. 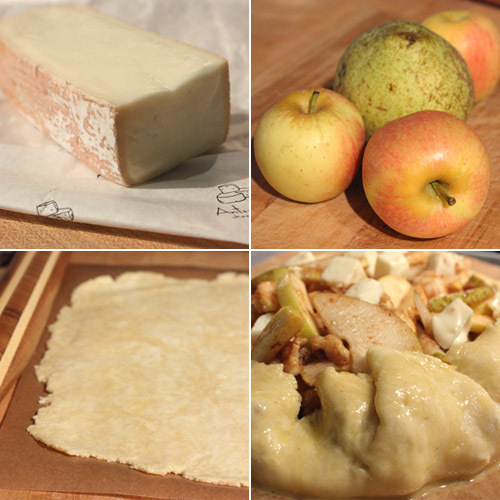 Then, the dough was topped with a mixed of chopped pears, apples, walnuts, half of the cubed taleggio, a little flour since I was using fresh fruit, lemon zest, cinnamon, sea salt, and honey. The edges of the dough were rolled up and over, and the remaining cubed cheese was scattered on top. The dough edges received an egg wash, and the crostata baked for about 40 minutes. I will say this is not a dessert for ice cream or whipped cream on the side. It requires no embellishment, but it was delicious with a glass of wine. 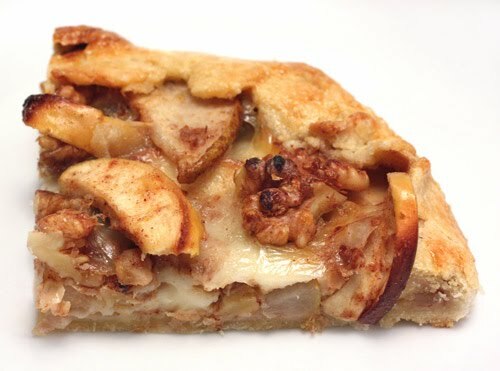 Nuts, honey, fruit, and cheese were enveloped in a golden, flaky crust, and the warm, sweet flavors were accented by the mildly tangy cheese. It’s still about 95 degrees, so I didn’t make fall happen, but the flavors made it seem like fall should be coming soon. If you have any questions about what to do with late summer eggplant, I have the answer. Make this fragrant, delicious spread and enjoy it with some flatbread. This was in the Paula Wolfert article in the May issue of Food and Wine. Then, I saw these double tomato flatbreads on Yeastspotting a few weeks ago, and the two seemed to belong together. 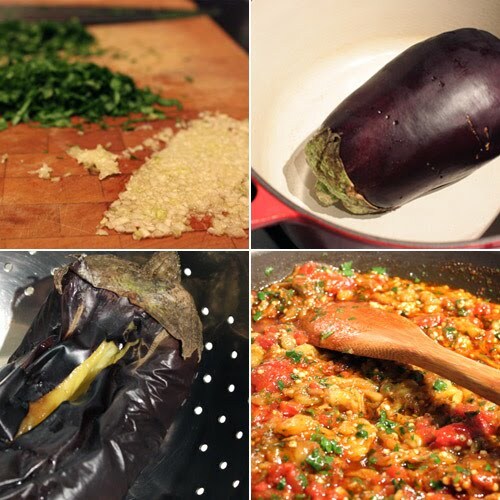 The eggplant is cooked whole on top of the stove, and then the meltingly tender flesh is combined with garlic, olive oil, canned, diced tomato, fresh herbs, and spices. This is a mixture that I knew would be a good one, and it smelled fantastic as it cooked, but the flavor was even better than I anticipated once I tasted it. I imagined there would be leftovers for lunch the next day, but the entire bowl was emptied quickly. I’m hoping to get a couple of eggplants at the farmers’ market this week so I can make it again but as a double batch this time. I used a dutch oven which was heated on top of the stove, and the big, one and a quarter pound eggplant was pierced and placed in it. It was covered and left to cook in the dry pan over low heat for 40 minutes. The eggplant was turned after 20 minutes. Then, it was placed in a colander in the sink and cut down one side so it could drain. Once cool, the flesh was scraped into a large skillet, and minced garlic, tomatoes, olive oil, parsley, cilantro, paprika, cumin, and cayenne were added. This was cooked until the liquid evaporated, and then lemon juice was squeezed into the mixture. Making the flatbreads couldn’t have been easier. I wasn’t able to find the suggested tomato powder for the dough, so I used tomato paste. That was combined with flour, yeast, sugar, salt, and paprika in a food processor. Water and vinegar were added while the processor was running. Sun-dried tomatoes were added and pulsed to combine, and then the dough sat in the food processor for about 30 minutes. The dough was divided, rolled into rounds, and quickly cooked in a hot cast iron skillet until it bubbled and was browned. We did have a few pieces of bread left over because this made eight pieces, and they freeze and re-heat nicely. Any flatbread would work fine here, and if I don’t have time to make homemade flatbread next time I’ll probably buy pita to go with it, but this tomato bread with bits of chewy sun-dried tomato was a very good match. 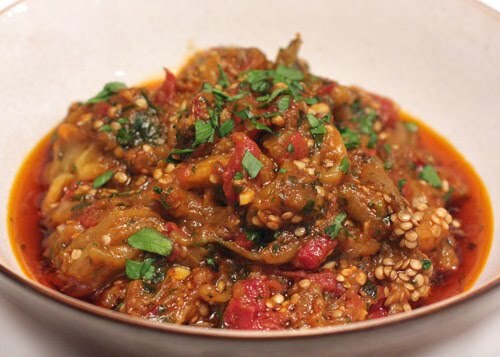 The cumin, cayenne, and paprika in the eggplant added depth of flavor, and the herbs and lemon perked it up well. 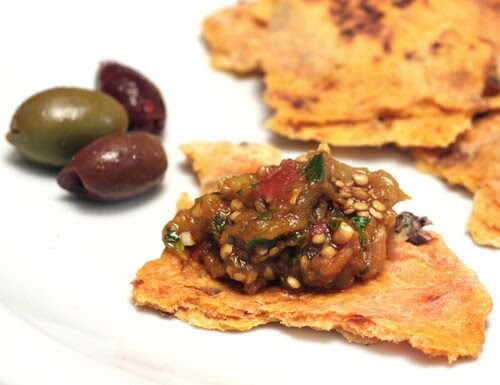 I could have made a meal of just the eggplant and flatbread, and with a few olives on the side and a glass of wine, it’s a great way to enjoy summer coming to an end. We’ve gone out to the desert again. When we plan a vacation, more often than not we choose to go back to the desert to hike in the rocky landscape and snap photos of saguaros from every angle and play as many of the hundreds of golf courses as we can. We like it here. This time, we decided to add something new to our itinerary. We’d never been to Sedona, Arizona despite how many times we’d been told we should see it. Sedona is north of Scottsdale, where we usually stay, and it’s also at a higher elevation at around 4500 feet. We drove up from Scottsdale and eventually realized that the saguaros disappear at around 3000 feet and are replaced by scrubby shrubs and short trees. Shortly thereafter along the drive, you begin to see the amazing red rocks. I knew we’d be hiking for several hours in those rocks, and when we got back to Scottsdale, we’d be hiking in the brown rocks there as well. 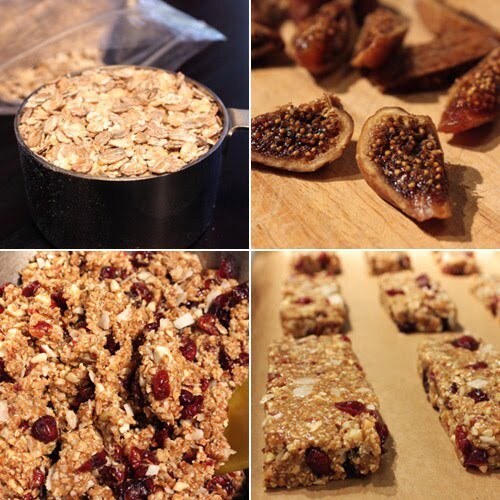 So, I planned ahead and packed these homemade fruit and nut bars so we’d have healthy snacks whenever we needed them. These are from the June issue of Food and Wine and were included in the article about visiting America’s national parks. The first ingredient in these bars is kamut flakes, and I really tried hard to find them. I put forth a thorough ingredient hunt complete with multiple grocery store visits and phone calls around town. When none were to be found locally, and I’m still considering opening my own shop to sell every ingredient I haven’t been able to find, I used a grain blend with oats, barley, and rye flakes instead. Those mixed grains were combined with pecans, cashews, honey, peanut butter, dried figs, flax seeds, canola oil, and lemon zest in a food processor and were coarsely chopped. Then, dried cranberries were added and pulsed just to combine. The mixture was formed into twelve bars on a parchment-lined baking sheet, and they were baked at 325 degrees F for 25 minutes. 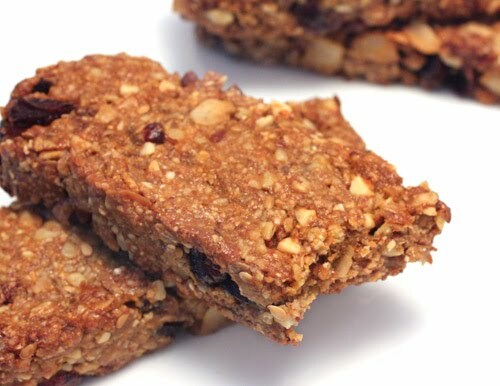 The bars were packed with chewy, crunchy goodness with great flavor from the nuts and peanut butter, and wrapped well in foil or packed in an airtight container, they last for several days. Now that I know how easy they are to make, I’ll be trying all sorts of grain, nut, nut butter, and dried fruit combinations. 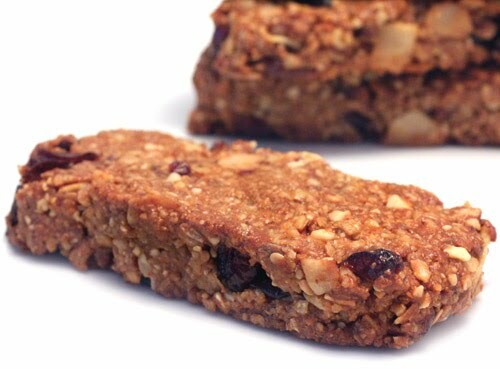 I may never buy a pre-made granola bar again. We brought these along as we hiked to Devil’s Bridge in Sedona. 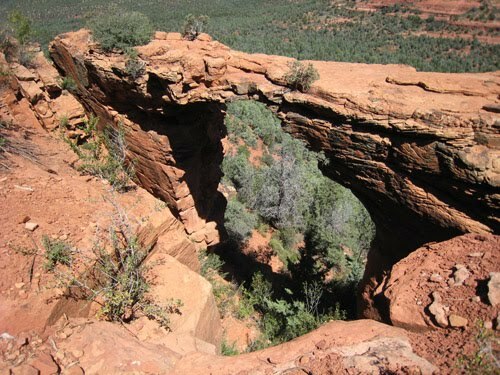 When we arrived at the top of the trail above the red stone arch, Kurt was crazy enough to walk out on it. I sat watching nervously, taking photos, and yelling ‘get back here.’ Then, we drove over to Boynton Canyon which offered an easy walking trail with incredible red rock views. 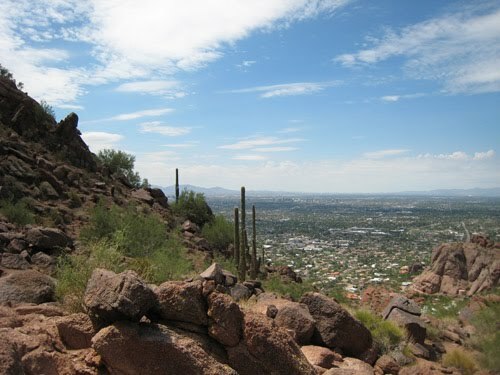 Later, in Phoenix, we hiked the summit trail at Echo Canyon which eliminated any need for time on a stairmaster that day. It’s straight up for just over a mile with stairs built into the trail in places, a couple of steep rock sections that require handrails, and a few places where you have to clamber over rocks. 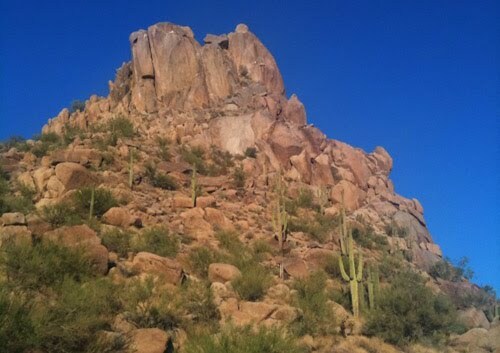 Last, we jogged at Pinnacle Peak in Scottsdale which is a smooth trail with both uphill and downhill sections, and it proved to be another good workout with a great view. Now, it’s almost time to leave the desert and return to reality. We’re taking home lots of new desert photos, and we’ll be back soon enough to discover other trails and hike our favorites all over again. When I’m having one of those 'what should we have for dinner tomorrow night' lack of inspiration moments, I often grab a Donna Hay book. I know the photos will quickly stir ideas for interesting meals, and I’ll be reminded of several things that I’ve been meaning to cook since I first got each book. 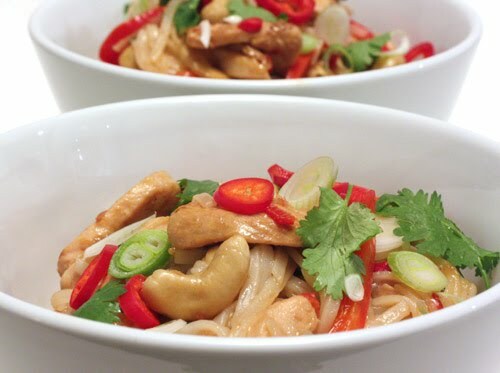 Donna Hay’s Off the Shelf is where I found this Asian-inspired cashew chicken dish. The flavors here are bright and lively with lemon juice, cilantro, and fish sauce, and there’s a minimum of fuss in the preparation. For a stir fry meal, the list of vegetables to chop was a short one with only red bell pepper, red chillis, and onion. You could easily make this a little more complicated with the addition of some greens like spinach or baby bok choy, but I stuck to the original version. Thick rice noodles were boiled while the boneless chicken was sliced and the vegetables were chopped. The stir frying began with the onion and chillis. Once fragrant and cooked through, those were removed from the pan, and the sliced chicken was added and browned. 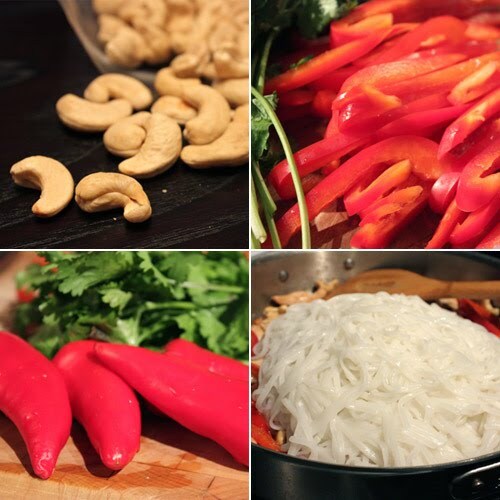 Then, sliced bell pepper and whole cashews were added followed by fish sauce, soy sauce, lemon juice, the onion and chilli mixture, and the drained, cooked noodles. Everything was tossed until combined and topped with cilantro leaves. I held back a few red chilli slices to garnish each serving. As is typical of Donna Hay dishes, this was as flavorful as it was easy to prepare. It was a comfort food kind of meal with lots of textural contrast between the noodles and the crunchy peppers and nuts. I was a little surprised that lemon was used here instead of lime, but the flavor wasn’t a disappointment. 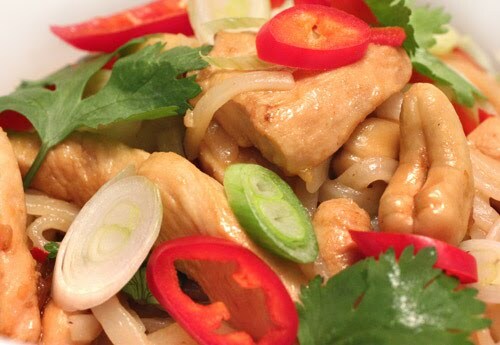 It mixed nicely with the fish sauce and soy sauce, and of course cashews and chicken just always play well together. And, the good news is that looking through that book again gave me some renewed inspiration for a few more upcoming meals. At last, hatch season is here again. It’s a great day when I arrive at the grocery store to find piles and piles of these seasonal green chiles from New Mexico. There’s a stack of hot chiles and a separate one of mild ones, and all the products made with the chiles are tucked into every corner of the store. Our local stores also roast the chiles, and you can buy them roasted whole or already chopped. I kind of enjoy watching them blister on the grill, so I tend to buy the fresh, raw chiles and roast them at home. During their short season, I’m perfectly content to just toss chopped, roasted hatch chiles into pretty much everything I cook, but this year I wanted to stuff some whole chiles too. 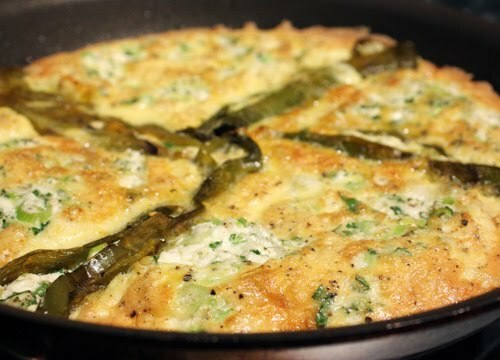 I pondered what to use for stuffing and what to serve with the chiles for a few days, and then I stumbled upon this omelet recipe which answered both questions. This is from Deborah Madison’s Vegetarian Cooking for Everyone . 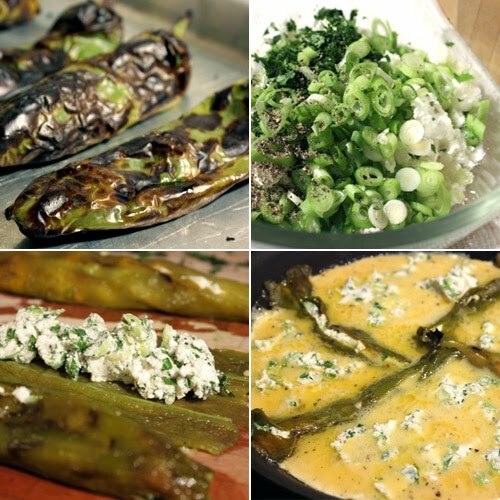 The roasted, whole chiles are stuffed with goat cheese, and then they’re surrounded by eggs and cooked into a big omelet. Of course, the same concept could be achieved with stuffed poblanos or anaheim chiles, but it was particularly fun to use some beloved late summer hatch chiles in this. 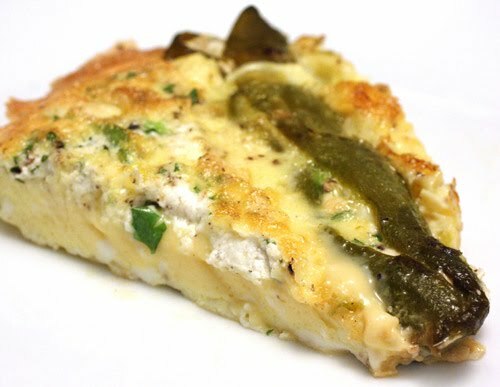 I had already roasted some hatch chiles on the grill the night before I planned to make this omelet. So, all I had to do was peel the charred layer off the chiles, split each down one side, and remove the seeds. The cheese stuffing was a quick mix of crumbled goat cheese, chopped cilantro leaves, and sliced green onions. I doubled the original recipe and stuffed four chiles with the cheese mixture. The remaining cheese that didn’t fit in the chiles was whisked into six eggs. The stuffed chiles were placed in a saute pan with some melted butter and were warmed over medium heat. Then the whisked eggs were poured into the pan and all around the chiles. I thought ahead and realized the chiles might be a challenge to cut through when serving. So, I arranged the chiles with their tips pointing to the center so they would fit into four pieces of omelet without being cut. The eggs started cooking on the stovetop, and as soon as the omelet began to set, the saute pan was placed under the broiler until the omelet was golden and puffed. I soon realized that this is not a particularly photogenic dish, but it was such a good idea I had to share it anyway. The stuffed chiles could have served as an hors d’oeuvre with some bread or tortillas, but they were divine in the omelet. The mild goat cheese with the fresh green onion and cilantro flavors mingling with the earthy, smoky chiles all embedded in a puffy omelet was genius. It was so simple but so delicious, and I never would have thought to do this myself.